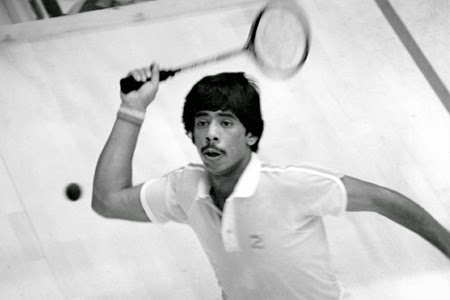 SERIOUS SQUASH: Who's The Best Squash Player Of All Time? Today I'm going to talk about a hypothetical situations. After watching the British Open and seeing Jahangir Khan in attendance it gets me thinking. Every sport tries to compare their current stars with previous legends of the game. Tiger Woods has always been compared to Jack Nicklaus and is chasing his total majors and now that same spotlight is shining on Rory Mcilroy. While people in baseball are often compared to the likes Ted Williams or Babe Ruth. In hockey many compare Bobby Orr or Wayne Gretzky to current top stars. How would these record holds stack up against the current crop of stars? Certainly to be mentioned and compared to one of the all time greats in your sport you are doing something right. Today I want to talk about two of the best when I was young; well Jahangir (pictured below) was at the end of his career when I was beginning to play and Jansher was just beginning to dominate. Both Khans were very steady and made very few unforced errors. They were extremely fit and I've heard that Jahangir just walloped the ball. Clearly the equipment advances and the glass courts with the lowered tins have changed the style of play that is successful at the highest level. But even now we see top players that are very traditional and conservative while others are much more attacking and aggressive. How would the Khan's have played in the modern game against the current crop of stars? Who wouldn't like to see a healthy Ramy against either one of them? It's hard to guess how the Khan's would develop as squash stars in today's game, but the one thing that wouldn't change is that thy would be two of the fittest and mentally toughest of any era. I'm sure they would still have immaculate length, but would they be more attacking? Would the Khan's have been able to dominate in today's game as they did back in the day? I can't think of any reason to think why they wouldn't. I'm more curious as to how the Khan's would play. I assume the success of these players had a big part in how future generations of people were taught and played. We learn by watching the top players and see what makes them successful. But as equipment changed allowing the players to be ore deceptive, have a shorter swing and hit the ball harder it's interesting to think how these legends would play with them. I do have a couple of old school small frame squash racquets that I use once in a while. What I notice when I use these racquets is that they provide excellent training tools for your swing. You need to have your racquet prepared early to hit it to the back, while the racquets nowadays you can flick your wrist and hit it down the wall if the ball is warm. Another thing I notice right away is that you cannot be as attacking. With the older racquets you learn when a shot is really on and when you may get away with forcing it a bit with modern equipment. I feel that most top players think they can attack almost anything from anywhere which of course may be true, but there are still better times and situations to attack short. I think it is more clear cut with the older frames. If you try and force it when it's not on with a heavy, small head frame you are going to make an error or pop it out loose more times than not. From everything I heard it was the Khan's discipline and work ethic which enabled them to be so successful. I have no doubt that they would adapt and still be the best in today's game. Ramy in recent years went an entire year without losing a match, but that doesn't come close to the 5+ years that Jahanagir did the same. You could always argue that the depth of the competition is stiffer now, but I think that would only have made them even stronger. So I haven't really answered my proposed question yet. I don't really know, but I'll take a few guess. I think the Khan's would play very attritional as well. 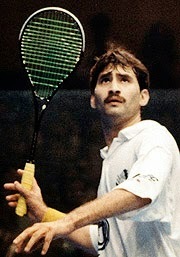 Jansher was so efficient with his movement that he could play long matches without slowing down unlike any of his competitors. I don't think this would change. I think Jansher would still have extremely long rallies and wouldn't shoot from behind his opponent, or if he did it would be so random that it would almost always work. It's been awhile since I've seen Jansher play, but I also remember how well he volleyed and counter attacked. I think this style would still win today. So I guess I don't think either of them would play like the top attacking Egyptian players. I could also speculate about how Ramy would have matched up 20 or 30 years ago with the old equipment on the standard court with the standard height tin? Maybe the game wouldn't have caught the interest of a young Ramy if he grew up with a small wooden racquet. I don't know. All we can do is speculate. But one thing I know for sure, is that I at least find it way more enjoyable to watch attacking and open squash. So although this sorts some players game more than others, you can attacking or neutralizing if your length, fitness and mental toughness is top quality. I should also note here how much the change in the scoring has changed how the game is played. Up until about 9 or 10 years ago we used hand in, hand out scoring to 9. This means you had to be serving to be able to get a point. It made matches much longer and physical which likely played into the strengths of both Khans. What matchup would you have liked to seen? Maybe Goeff Hunt, the late Hashim Khan, Jonah Barrington or Chris Dittmar versus Gaultier, Elshorbagy or Matthew? Or more recently Peter Nicol or Jonathan Power? Who would be the best of all of them at their peak? Does your winner change depending on the scoring, court or equipment they used? Who's the best of all time? For those that haven't seen either Khan play here's a link of them playing one another https://www.youtube.com/watch?v=GtzhAcmgVvY, but this is near the end of Jahangir's career. You can see that here the scoring was actually point a rally to 15 and the 2 are actually playing on a glass court. When looking back on footage of them the first thing you notice is the extremely poor quality of the video. It's hard to follow the ball. I remember back in the early 90's having to wait months after a tournament to finish to get a copy of the finals and it would be on VHS and the quality extremely low. This also gets me thinking what squash will look like in 20 or 30 years time. Will it continue evolving as quickly as it has? What style will the top players play? What will the equipment be like? Will the racquets become heavier again or even lighter? I feel that string and grip shape may change the most. Will the scoring method change again? Will the tin be lowered even further? Is there a kid out there now who will transcend our sport? Will it be a version of one of the Khan's? Or more like Power? Ramy? Or perhaps a mix or something completely altogether? This hypothetical situations is really so helping at the players.Good sharing blogs. Ways to years as We have all spotted Jansher take up, and yet I just also remember the simplest way most certainly the guy volleyed not to mention counter top assaulted. These folks were incredibly in shape along with We've seen that will Jahangir only walloped your soccer ball. Evidently kit advancements plus the wine glass tennis courts while using diminished tins get improved your kind of participate in that may be profitable with the top amount. Nevertheless even today many of us discover prime avid gamers which have been quite classic along with careful and some are generally additional approaching along with ambitious. It is really very difficult which you can follow a tennis ball. I recall instruction online the early 90's required to put it off many months after the tournament situation to conclude for any clone of your finals plus it would for VHS as well as level of quality highly very low. It's nice to speculate who indeed is the greatest of all time - who beats who in their prime. We will never know but the more relevant fact is that the players of before have helped evolve the game for the players of today. The sport will continue to reinvent itself thanks to the players of all ages. 10.= Jonathan Powers, Chris Dittmar,Peter Nicol, Aftab Jawaid, Roshan Khan, Ross Norman, Mohibullah Khan, Gamal Awad, Hiddy Jahan, James Dear (possibly the greatest rackets' games' player ever).